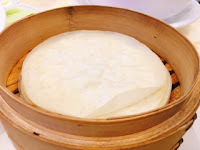 In my opinion, some of the best restaurants are small family run affairs; Peking Duck Kitchen seems no different with father and son in the kitchen and mom and other son running the front-of-the-house. Food may arrive slower and dishes don’t arrive with serving cutlery, but good things come to those who wait. Think of the first as a paid amuse bouche: six bite-sized slices of the thickest skin served in sugar. My husband describes it as duck candy, which may sound odd, but the crisp skin and bit of oil that leaks out goes nicely with the sugar – like a duck skin timbit. Next, the main course, where the fowl’s skin and meat is sliced and arrives with steamed flour wrappers. 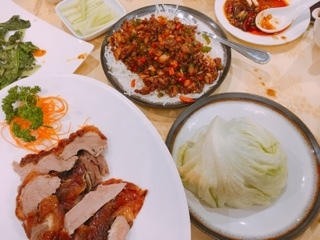 The duck’s skin is crispy despite not being fried (you can monitor the cooking process with their open kitchen and the oven on display) and there’s a bit of spice added to the bird so by itself there’s already flavour. Even the wrappers are outstanding, so translucent and thin, but strong enough to withstand being pulled apart and filled with three slices of duck. Nothing fell apart and I happily bit through each sweet (thanks to the hoisin) and crispy bite. Plenty of skinless cucumber and scallions are included to help cut through the fattiness of the duck. 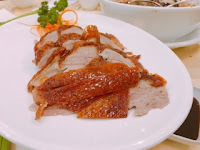 Having had my fair share of Peking ducks in Toronto, it was one of the tastiest. The lettuce wraps were average, there’s enough seasoning and contrasting textures, but too much fried vermicelli – a bit is good, but when there’s too much it tastes like you’re eating bits of Styrofoam. Lastly, the duck bones. By now there’s very little meat left on them, given everything has been sliced off and even the meat around the carcass is shredded off for the lettuce wraps. 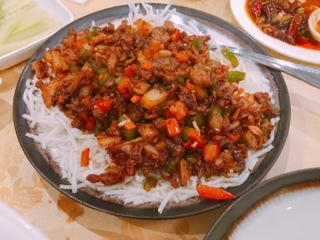 Nonetheless, you can jazz them up – for an extra $4.99 the chef stir fries them with salt and pepper to give it interest. If only the restaurant has television screens playing sporting events … imagine the viewers who’d love to nibble on these while drinking cold beers (they have mini kegs available). Peking Duck Kitchen isn’t a one dish wonder. Everything else we tried was solidly executed. 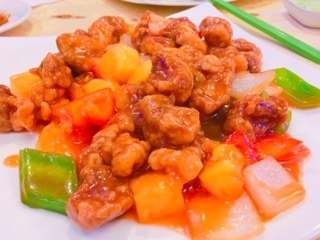 I had doubts about ordering sweet and sour pork ($9.99) at a Beijing restaurant, but was pleasantly surprised with the outcome. The sauce was balanced in terms of flavours and consistency (not too thick that it became slimy but thick enough to cling to the ingredients). 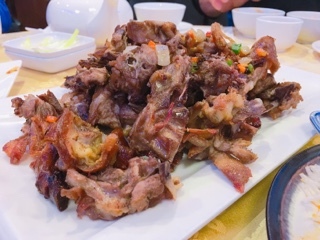 Each bite of pork had enough batter to develop a crispy exterior but you could still taste the meat. The bell peppers remained crunchy and even in the dead of winter the pineapples were fresh as opposed to the canned variety. 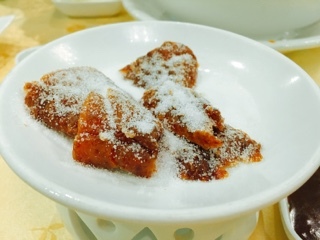 Another popular Sichuan dish is boiled fish filets in hot chili oil ($14.99). 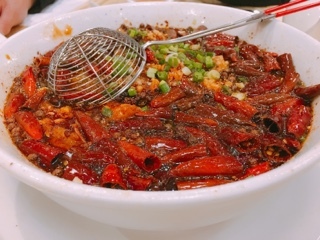 It’s one I’m generally not ecstatic about as it becomes a chore to try to pick out all the chilies – especially the smaller Sichuan pepper that releases a bitter taste and numbs your tongue. Luckily, the wire mesh helps extract the fish easier and I like that the soup underneath wasn’t a clear broth, instead incorporating something sweet (perhaps bean paste or oyster sauce) so that the fish has taste even without the peppers. 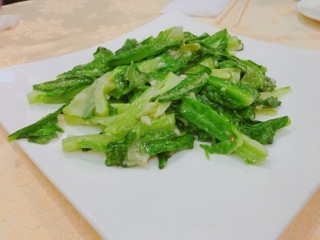 If you’re wondering what the garlic A dish ($8.99) is, the “A” denotes the A choy, a leafy green vegetable that has the whispy leaves of romaine lettuce and the crunchy stalk of Chinese broccoli (or gai lan). Sometimes the vegetable can have a slight bitterness, but this wasn’t evident at all at the restaurant, maybe due to the abundance of garlic in the dish. Some Chinese restaurants give complimentary soups, a custom they don't follow at Peking Duck Kitchen. Nevertheless, their menu has plenty to choose from and the prices are reasonable. 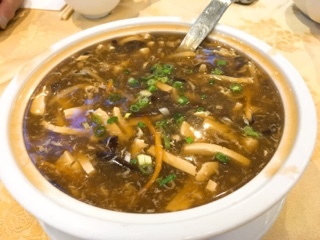 We settled on the hot and sour soup ($7.99 for a medium) that was large enough for a table of six. The restaurant certainly doesn’t skimp on ingredients with plenty of slivered vegetables, tofu and black fungus. The soup’s taste, although still enjoyable, was a little off for me. The “hot” came from adding tons of cracked black peppercorns to the broth instead of chili, so the soup tickles your throat as consumed. Meanwhile, the “sour” really wasn’t prevalent – something I personally enjoy – but could be the missing flavour for someone else. Mom and pop restaurants always have a special place in my heart. The décor may not be picturesque and the service less polished, but I appreciate that many stick to dishes they can execute well and at Peking Duck Kitchen you can’t go wrong with the duck.